TRAILER HITCH PART # 75699. Up to 500/5,000 lbs. Up to 750/7,500 lbs. 35" L x 17.3" W x 10.1 H.
Jeep, Grand Cherokee, Except w/OEM Tow Hook. Jeep, Grand Cherokee, w/OEM Tow Hook. Jeep, Grand Cherokee, Except w/OEM Tow Hook or ECODiesel Engine. Jeep, Grand Cherokee, w/OEM Tow Hook, Except w/ECODiesel Engine. Hitch crosstube concealed behind bumper. W/ OEM Tow Hook: Additional installation time may be required. 2 Square Receiver Tube Opening. Max-Frame receivers are designed for trucks, vans and sport utility vehicles. Neat Appearance, All Frame Attachments. A-Coat Base w/ Black Powder Coat Finish. Rated up to 5,000 lbs. Rated up to 7,500 lbs. Solid All-Welded Construction for Maximum Strength and Safety. Ensures Perfect Fit and Top Towing Performance. Computer-Aided Design and Fatigue Stress Testing. Designed to Withstand Road Abuse Within Specified Capacities. Orders placed by 1 p.
Orders placed after 1 p. We Dropship direct from Cequent Performance Products, Inc (Manufacture of REESE, Draw-tite & Hidden Hitch From Various Locations) to all locations in the 48 States. 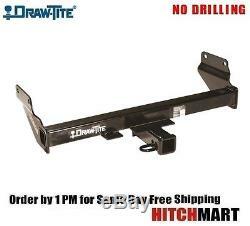 The item "FITS 2011-2019 JEEP GRAND CHEROKEE CLASS 3 TRAILER HITCH 2 TOW RECEIVER 75699" is in sale since Monday, September 7, 2015.